Want to update your kitchen? Considering a small project like refinishing cabinets or a totally new space complete with granite countertops, hardwood floors, stainless steel appliances and more? Whatever size project you have in mind, Virtual Architect’s software gives you the easy yet powerful creative tools needed to turn your dreams into reality today! No Design Experience Necessary - Using a wizard-driven interface with drag and drop simplicity, Virtual Architect’s software makes it easy - PLUS, there's FREE video tutorials! Easily add brick, stone or other materials with complete control. Easily specify your railings, steps and balusters' paint and stain colors. Upload photos of your current home interior and do a virtual room makeover. Visualize design projects before investing time and money on labor, supplies & equipment. Select from an extensive library of 3D interior & exterior furniture, appliances and materials. 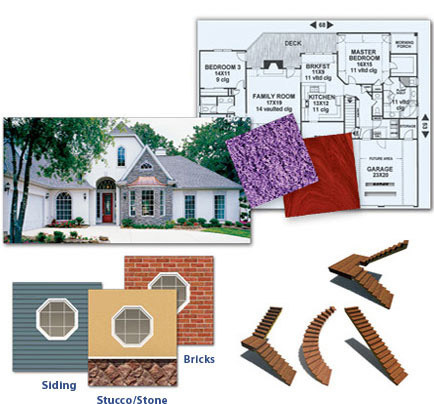 Build a Home from Scratch - Utilize the extensive Home Plan Library and customize your design. Select the home style, number of floors, rooms, materials, doors & windows, electrical & plumbing and even landscaping. Then, handle all the interior decorating yourself! 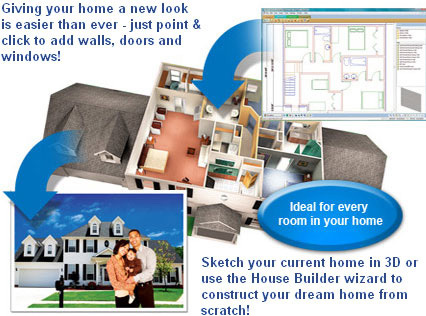 Remodeling - Import existing plans directly into the home designing software or use the Home Builder wizard to help design your new dream room! Plus, you can even generate blueprint-style plans to give to contractors. Room Makeovers - Whether you're remodeling a room or redecorating an outdated one, Virtual Architect software is like having your own interior decorator in a box! Specify your roof's dimensions and style while experiencing your home in 3D. START DESIGNING YOUR NEW HOME TODAY!